Use these pour spouts at the bar for both liquors as well as in the kitchen for oils. This is an upgrade from the traditional pourers because of the cap. Its hinged flip cap and rubber stopper are designed to help prevent splash-back and keep your product closed off from the open air when not in use, keeping liquor fresh and protecting it from contamination. Metal bottle pourer spouts are by far the most popular pour spouts in the Bar, Nightclub, and Restaurant industries today. Try it out on bottles of olive oil, vinegar, coffee syrups, and other products you use frequently. It will offer the same great benefits. Additional Info: Material: 304 Stainless Steel and High Quality Black Rubber Cork. Air vent tube to insure smooth pouring. Free Flow Speed Pourer Style. Compiles with all international standards. Pours liquor, wine, juice, syrup, oils, and more. Made of 18/8 stainless steel, food grade material and 100% non-rust. Many similar liquor pourers use plated copper instead, which many countries consider hazardous to public health and have banned use as a food safety precaution. This Tapered Metal Speed Pourer offers the smooth pour speed and features a metal flap that easily opens during a pour and closes when the bottle is in a resting position. The flip-top cap acts as a barrier to fruit flies and other pests. Great for those states that require pour spout protection. Theses Liquor Pourer's tapered design offers control, accuracy, and the most perfectly consistent pour speed every time. When you use one of our liquor pour spouts you will experience less spillage and less mess. 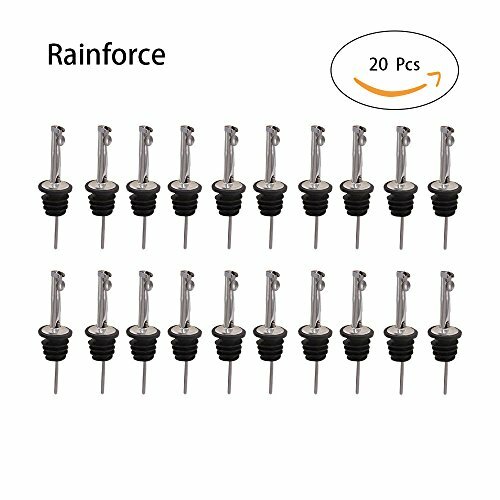 These pour spouts are economically priced and made of high quality stainless steel with a durable rubber cork. They fits a multitude of different liquor bottles, easy to remove and replace, simply hand wash in soapy water and you'll be ready to use again. If you have any questions about this product by Rainforce, contact us by completing and submitting the form below. If you are looking for a specif part number, please include it with your message.